The Land's Sake Farmstand features in season produce grown using organic methods from our own farm. Located in the center of Weston, it's easy to swing by and stock up for the week or pick up a few things for dinner. In addition to the diverse selection of our vegetable crops, we are proud to offer other local produce and artisan products. We're a small-scale farm dedicated to growing a wide variety of crops on mid-sized fields, so every trip to the Farmstand is a little different. Come for old favorites, but be sure to try a few new things, too! 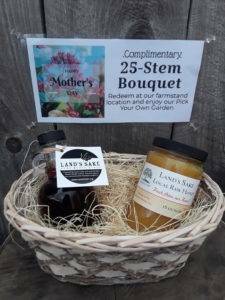 Choose between our Mother's Day or Bee Local baskets to give mom the gift that keeps on giving! 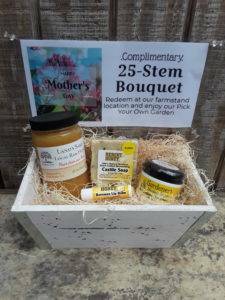 Each basket includes a voucher for a free 25-stem bouquet from our flower garden, so mom can visit the farm to pick her own flowers! Price includes shipping, gift wrap, a gift tag, and a reusable planter. We ship directly for you anywhere in the continental U.S. or deliver locally. To make your gift even more special, add Famstand Gift Certificate, or a 1-year Land’s Sake membership! We appreciate any support to help with our mission of connection people to the land through Farming, Forestry, & Education! If you need to order large quantities, have special requests, or multiple shipping addresses, please email heather@landssake.org directly to confirm details. Orders must be placed by Monday, May 6. Looking for a gift for your child's teacher or a special person in your life? We're offering Farmstand Gift Certificates so that you can share your love of delicious, local produce and artisan foods with someone special! Buy yours now! You may choose any amount. Gift certificates may be used to buy any item that's for sale at the Farmstand. Every gift certificate expires at the end of the farmstand season it was purchased. You can buy your gift certificate online or at the Farmstand. If you buy your gift certificate online, we give you the choice of either having us mail your gift certificate to your address or you can pick up your gift certificate at the Farmstand when it's open (June-October). The Farmstand is closed for the season. We'll re-open in June 2019! Check back in June 2019 to see what we'll have at the Farmstand! *Please note that our selection varies seasonally and day by day. We update the list above weekly, generally by Tuesday afternoon. Due to Mother nature's whims, the list above is approximate, not exact. Once we sell out of a vegetable, that's it until the next day! available produce, sign up for our email newsletter. November 23 from 10 am - 2 pm.